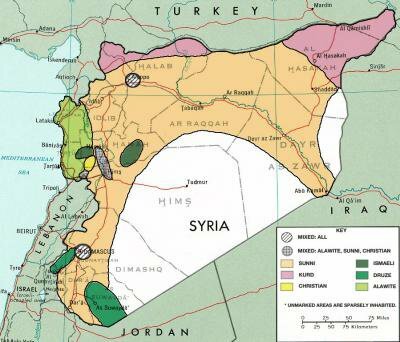 Sectarian map of Syria, typically found next to articles by Middle East experts. Wikimedia commons. 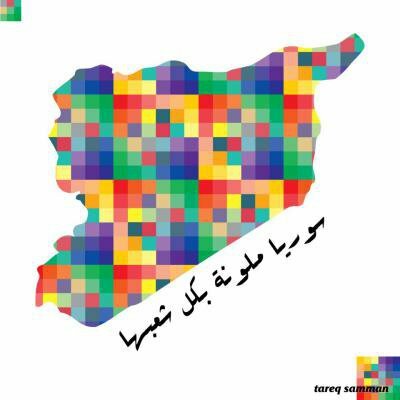 Since the early days of Syria’s uprising in March 2011, sectarianism has become the subject of heated debate. The uprising’s early instigators, non-violent young activists, attempted to respond to the sectarian slogans attributed to it by regime propaganda (most famously, 'Alawites to the coffin, Christians to Beirut', with unifying cries of 'One, one, one, the Syrian people are one,' and 'Not Salafist, nor Ikhwani, the revolution is that of youth.' But as the regime’s brutality intensified, primarily targetting leading non-violent activists, “the movement was left in the hands of less experienced youth who could not counter the sectarian discourse, but rather indulged in increasing Islamisation in reaction to it,” according to Syrian-Palestinian thinker, Salama Kileh. This set the pace for the sectarian narrative to dominate debates, particularly as the uprising mutated into a civil war and the Syrian question took a backseat to geopolitical considerations and the growing threat of extremist groups. In a country where sectarian issues were ruthlessly suppressed for many decades, and where “instigating sectarian tensions” was a blanket accusation against all political dissidents, the explosive growth in sectarian discourses caught the intellectual elite completely off guard, eliciting a multitude of reactions. The growing corpus of analysis and debate over the issue in the past three years contrasts greatly with the forced silence of the last half century. This is a two edged sword in that it finally allows the issue to be discussed freely and analysed critically; but it also propels it to the forefront of the Syrian conflict and thus relegates equally pertinent issues, such as class and urban/rural antagonisms. More ominously however, the dominance of the sectarian narrative contributed to the disintegration of the early ideals of 'dignity and equal citizenship', which were replaced with 'sectarian rights, and the protection of minorities' - an instrument of manipulation, in other words, in the hands of both the regime and its detractors. This course of events has perpetuated many debates among Syrians, both collectively and individually. The discussions barged through the taboo on many topics including the relationship between the regime, the state, and sectarianism; relations between the sects themselves, as well the creation of a new concept - 'political Alawism'. One of these debates was a prominent altercation between Syrian-Palestinian thinker Salama Kileh, and Syrian writer Victorious Shams. The genesis for that particular discussion came in Kileh’s article, in al-Araby al-Jadeed, where he critiqued and rejected the sectarian label of the Syrian regime and stated that, “the conflict in Syria is not between a majority (classed as Sunni) and a minority (classed as Alawi) but rather a conflict between a population (in its many identities) against a tyrannical and corrupt authority.” This prompted a response from Shams arguing that the “Syrian regime is the godfather of sectarianism and its main perpetrator”. In SyriaUntold's collaboration with openDemocracy, 'Looking inside the uprising', one of our aims is to widen the scope of the discussion on sectarianism and open it up to new thoughtful intersectional horizons. We plan to move beyond the simplistic question of whether the Syrian regime is indeed sectarian or not, but rather to investigate and to critically frame the underlying concepts - particularly, sectarianism and its relation to authority. We will build on the dialectical conversation between these two authors, to methodically dissect and deconstruct the complex issues at hand in order to bring a more holistic approach to the subject. This discussion begins with a set of questions we addressed to both Salameh Kileh and Victorious Shams. The resulting conversation and commentaries will hopefully offer the reader angles and layers of comprehension that take the sectarian issue beyond its instrumentalization by the Syrian regime and other geopolitical forces.